March is fast becoming Month of the Manhunter here at CMMH. With all the Brightest Day hullabaloo, there's the promise of a reboot of many a character back to their Silver Age days. First, I urge you to read Manhunter of Integrity over at I-HoD (Idol-Head of Diabolu), a post explaining J'onn's original incarnation as a detective, which is the essence of his character. It's a great introduction for readers and a guidepost for writers on how to remain faithful to this character's original design. Currently, the Martian Manhunter has derailed mightily from his roots, and I hope that will be fixed. 10. Stop trying to explain the weakness to fire. Guys, you don't even need to bother with this. Just accept it and move on. It's part of the premise of his character, and yet I've lost count of how many writers have tried to explain it, make sense of it, or just plain get rid of it. It's psychological, it's a phobia, it's genetic, it reminds him of the funeral pyres during the plague on Mars, it's only flames of "passion," etc., etc., etc. How many multi-issue arcs have been written about why Kryptonite affects Superman? Or did Superman ever go so far as to be best buds with Metallo to "get over" his weakness? No, because the Man of Steel needs no explanations. What's that, Mr. Jones? Earth weakness? Yeah, you heard him. Fire only weakens him on Earth. So there you go: now you don't have to worry about how a whole civilization got built without fire, becuase it probably didn't. Just like the yellow sun of Earth somehow mystically gives Superman his powers, fire on Earth mystically takes them away from J'onn. No need to explain it. Simple, no? As for fire, I'm of two minds on this. There are many stories I enjoy that deal with it well, including the stories you allude to, and I agree that the silver age explanation (or lack thereof), has a logic all it's own. Not everybody had access to the best science of the day, which wasn't that great to begin with, so much can be forgiven. On the other hand, I value verisimiltude in my fiction, especially my science fiction. Superman and MM both have a lot of aspects that need adjustment to pass my muster. Things like flight, heat vision and telepathy, are all with in the realm of possiblity, albeit far from science fact at this juncture. I'd like to see a reboot of the entire universe with definite thought given to the physics of that universe. I think Invincible has handled superpowers in a consistent and interesting way. The superbeings there are all very tough and strong, but are often pushed to the limit by other superpowered beings. They don't have any Kryptonite, they just don't have unrealistic (at least in comicbook terms) power levels. While they are clearly tougher than pretty much everyone, the government, and other non superpowered beings, are often credible threats, just like they would be in real life. Fire has a lot of different possiblities, and I think it's main problem is that none of the interpretations to this point have been a good way of handling it. Like Bane's venom or Flash's speed, story arcs dealing with questions are often ignored by the next writer who thinks he has a better idea, regardless of final the previous take. In summation, I agree that fire shouldn't be such a constant question, and really shouldn't touched until well into a run. Other aspects of the character need to be solidified first. Still, a definition of the fire weakness, or even doing away with it, if done well enough, would be the ideal in my opinion. Yeppers. 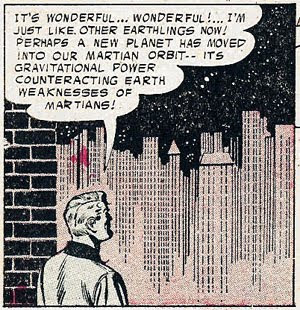 Aside from that stint in the '70s when he was immune to kryptonite, nobody ever fixated on explaining away something as simple as "Kryptonian-specific radiation poisoning." I've long planned a whole post devoted to this topic. For the record, pretty much every planet gave J'Onn J'onzz some variation in powers, so that's a can of worms there. The import thing is that writers give up on writing out the fire weakness. It's been tried, it never works, and it shouldn't besides. "nobody ever fixated on explaining away something as simple as "Kryptonian-specific radiation poisoning." Exactly. Ironic that the parallels to Superman end with the weakness, isn't it?